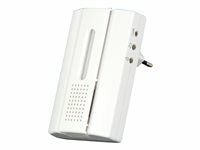 This wireless doorbell chime receiver with 5 melodies, 4 volume levels and 4 memory addresses can be placed in any indoor socket and it is compatible with any COCO transmitter (max. 4 transmitters per receiver). It's possible to activate multiple chime receivers with the same push button. It is also possible to activate a single chime receiver with multiple push buttons. It is even possible to assign a different melody and volume for a push button at the front door, a push button at the back door and a motion sensor in the backyard. This way, you immediately know at which door someone is waiting or when someone walks through the yard. Since each chime receiver has an electronic memory with 4 memory addresses, it is possible to activate the same receiver with 4 different transmitters. The big green LED-indicator blinks when the chime is activated. This is a perfect feature for people with hearing problems or in noisy environments.